Patriarch Kirill of Moscow and All Russia believes monks should not use the Internet, to protect themselves from temptations. “The Internet is a big temptation these days. 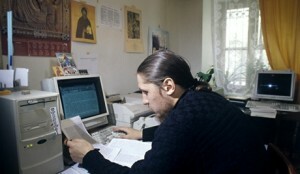 Many monks do something that I believe is totally unreasonable: on one hand, they leave the world to create good conditions for salvation, but on the other hand they take their mobile phone and go online, where, as we know, there are a lot of sins and temptations,” Patriarch Kirill said during a meeting with monks living in Zograph Monastery on Athos. “It is not without reason that monastery traditions are so strict. Their strictness is aimed at creating the best conditions for the salvation of the soul. For this reason, monastery traditions should be observed,” the Patriarch was quoted by the synodal information section as saying. “When a monk takes a mobile phone in his hand to go online, shouldn’t he think whether he should be in a monastery at all?” the Patriarch said.